We’re also looking for another very important group: adult and high school volunteers. There are two ways to help: 1) We need “shepherds” to accompany the children during dai- ly activities. You don’t need to have a child in the program to volunteer! (Nursery childcare is available to volunteers.) 2) We need volunteers to help us decorate before the week begins, and volunteers to help us clean up on Friday after the performance. Just complete the volunteer form below. Registration is available for those ages 4 (by Sept. 1) through 14. (Note: The 4 yr. old group will be limited to the first 24 who register.) online at http://www.friendsofthegroom.org/vbs- 2019 or pick up a registration form from the church office. Registration deadline is July 15, 2019. Friends of the Groom at (513) 831-2859. Wednesdays 10:30 am – Hearth Room. Come and enjoy some fellowship and a cup of tea or coffee on Tuesday mornings this fall! Our group is informal and relaxing… a time to talk about life! Child care is free and available with Joy and Rhonda. Everyone is welcome! For more information, please contact Linda Swensson at lindaswen294@gmail.com. 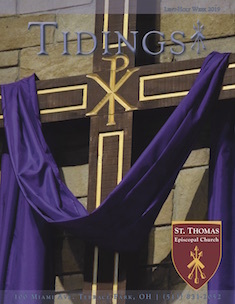 The Bach Ensemble of St. Thomas will begin a new season of Vespers services on Sunday, October 7 at 5:00 p.m. as they present J. S. Bach sacred cantata Jesu, der du meine Seele (“Jesus, you have freed my spirit”), BWV 78 at St. Thomas Episcopal Church in Terrace Park. The Ensemble and Bach Choir will be featured in this true masterwork of the genre, including soloists Melissa Harvey, Maggie Schwenker, Andreas Kirtley, and Michael Young. At 4:30 p.m. Xavier faculty member Douglas Easterling will lead a Pre-Vespers lecture in the parlor, giving insights and background into the feature cantata. The prelude for the service will be the astounding Trio Sonata from Bach’ Musical Offering, BWV 1079, to be played by Cincinnati Symphony Orchestra musicians, Charles Morey (violin), Randy Bowman (flute), and Jennifer Monroe (bassoon) along with Bach Ensemble Artistic Director Carlton Monroe (harpsichord). The Bach Vespers service combines the rich tradition of evening prayer with the spiritual treasury that is the cantatas of Johann Sebastian Bach, as well as music from his musical ancestors and heirs. The service follows the outline of Anglican evening prayer and consists of several parts: an invitation, readings, canticles, and chanted prayers. Following this we listen to a spoken reflection and the cantata chosen for the day. The service concludes with a congregational hymn and prayers of thanksgiving. The service encourages attendees to reflect not only on the words and their meaning, but also on the immense beauty of our God-given world, and the creative spirit which fuels both this music’s composition and performance. Regardless of faith tradition, spiritual beliefs, or musical background, all are invited to enjoy the beauty of this service and the peace that this evening brings. The Bach Ensemble of St. Thomas is a professional ensemble dedicated to enriching the musical and artistic life of the Cincinnati area through the performance of the music of J. S. Bach, his contemporaries and his musical heirs. The BEST serves as ensemble-in-residence at St. Thomas Episcopal Church where it leads the monthly Bach Vespers, performing the cantatas of J. S. Bach in the context for which they were written. The BEST is committed to historically informed performances of Bach’s music and artistic collaborations with other musical ensembles.